Mcity operates the world’s first purpose-built proving ground for testing the performance and safety of connected and automated vehicles and technologies under controlled and realistic conditions. Testing new technologies in a safe, controlled environment is essential before deploying automated vehicles on public streets and highways. 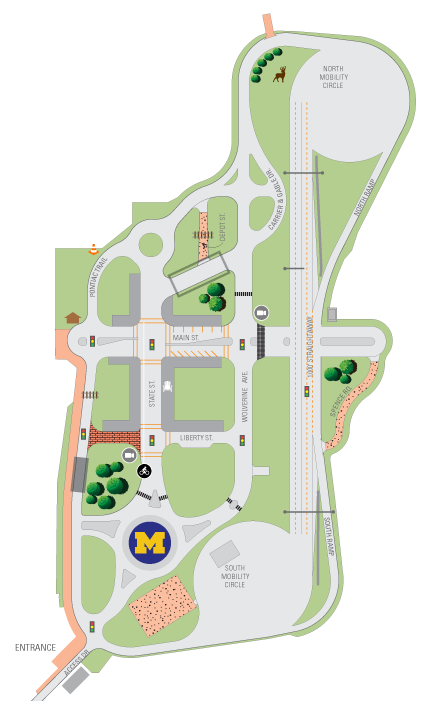 The Mcity Test Facility sits on a 32-acre site on U-M’s North Campus Research Complex, with more than 16 acres of roads and traffic infrastructure. The full-scale outdoor laboratory simulates the broad range of complexities vehicles encounter in urban and suburban environments. State-of-the-art instrumentation throughout the facility includes a control network to collect data about traffic activity using wireless, fiber optics, Ethernet, and a highly accurate real-time kinematic positioning system. Patent-pending augmented reality testing technology allows physical test vehicles to interact with virtual connected vehicles in real time inside the facility. Open-source API controls testing conditions throughout the facility. Infrastructure can be controlled with software. The facility uses vehicle-to-everything (V2X) communication throughout the facility and 5G connectivity. Please note: Mcity is a closed facility. Due to safety and confidentiality concerns, access is limited to those involved in testing and research. Mcity is the world’s first purpose-build facility for testing connected and automated vehicles and technologies under controlled, realistic conditions before trying them out in real traffic. Mcity includes urban and suburban streets, plus road signs, pedestrian crossings and other features to simulate real-world urban and suburban driving conditions. Dummies can be used at Mcity to test pedestrian avoidance technology in automated vehicles. Road signs at Mcity are not pristine by design to effectively replicate real-world conditions. Testing scenarios can be configured to meet the specific needs of Mcity users evaluating advanced mobility vehicles and technologies. The Michigan Department of Transportation helped fund construction of the Mcity Test Facility, and provided traffic signs, overhead freeway signs and other equipment that had been taken out of service.